MPF contains a “Scriptlet” concept which lets you add custom code to your game. Scriptlets are Python modules that run at the “root” of your game. You can use them to do anything you want. Note that MPF also has the ability to run custom mode code which is code that is associated with a certain game mode and is generally only active when the mode it’s in is active. So if you just want to write your own custom game logic, you’ll probably use mode code. Scriptlets, on the other hand, are sort of “machine-level” custom code. Scriptlets are nice if you have some kind of custom device type that doesn’t match up to any of MPF’s built in devices. The elevator and claw unloader in Demolition Man is a good example, and what we’ll use here. First, add a scriptlets folder to your machine folder. Then inside there, create the Python file that will hold your scriptlet. You can name this file whatever you want, just remember the name for the next step. Note that MPF contains a Scriptlet base class which is very simple. (You can see the source of it on GitHub here.) We called our class Claw in this case. Pretty much all this does is give you a reference to the main MPF machine controller at self.machine, as well as setup a delay manager you can use and set the name of your scriptlet. There’s also an on_load() method which is called when the scriptlet is loaded which you can use in your own code. Next, edit your machine config file and add a scriptlets: section, then under there add the module (file name) for your scriptlet, followed by a dot, followed by the class name for your scriptlet. At this point you should be able to run your game, though nothing should happen because you haven’t added any code to your scriptlet. 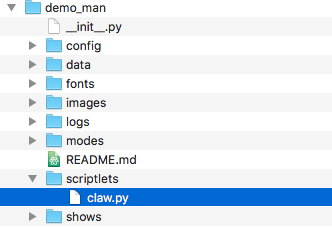 Take a look at the final Demo Man claw scriptlet to see what we did there. Since Scriptlets have access to self.machine and they load when MPF loads, you can do anything you want in them. """Claw controller Scriptlet for Demo Man"""
# the elevator when MPF starts, and if so, we want to get it. """Start the claw moving to the left.""" """Start the claw moving to the right.""" """Release the ball by disabling the claw magnet.""" """Aumatically move and release the ball.""" # If we're not at any limit, we can release the ball now. """Get a ball from the elevator.""" """Pickup a ball from the elevator"""
# the claw has it, the player can move and release it on their own.